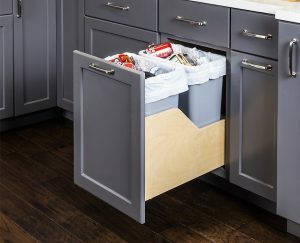 Under counter Waste Can Organizers are a popular kitchen renovation project and are often installed in new construction. A trash can controls odors and the spread of bacteria so it is important to keep the trash cans away from the food preparation area. But you still need a waste container handy for throwing away scraps and food packaging. 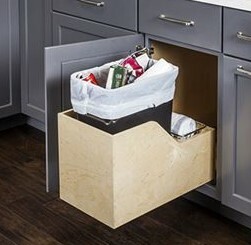 The solution is the under counter Waste Can Organizer. Van Dyke’s Restorers now offers the cabinet organization collection from Hardware Resources including a great selection of waste cans organizers and trash cans. 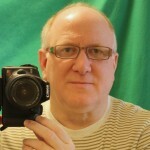 They come in two basic styles, top mount and bottom mount with various options for each. The Top Mount units feature a Dura-Clo se soft-close rail system that mounts to the inside of the cabinet and the front of the cabinet door. The self-adjusting brackets have a weight capacity of 100 pounds and hold one or two trash cans (not included). Single units come with a stainless steel basket to hold a 35-qt. or 50-qt trash can. Solid white birch construction assures years of reliable service. Bottom Mount units are pre-assembled and mount to the cabinet floor with four screws and feature 100-lb. full-extension soft-closing under mount slides and birch plywood construction. Designed for cabinets with 12 5/8” (single) or 17 5/8” (double) minimum cabinet opening. The Wood and Metal Bottom unit features sleek epoxy-coated grey metallic drawer sides and UV coated edge-banded birch plywood front, back and bottom panels. The front has a tall, scoop handle for sliding the unit out. 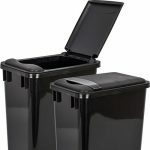 The waste organizer ships with two 35-quart trash cans in Black or White designed for 13-gallon tall kitchen trash bags. A fourth option is the Wire Bottom Mount which features thick wire frame construction and heavy-duty full-extension slides with 100-lb. load rating. Slides are easily mounted to the bottom of the cabinet using four included screws. An optional door mounting kit is available. Choice of single or double can units are available with double can models requiring a full-height cabinet. Black, White or Polished Chrome finish. Waste containers and lids are sold separately in 35-qt. and 50-qt. sizes in Black, White, Gray or Green (great for recycling). They are made of high-quality polymer material that is durable and easy to clean. 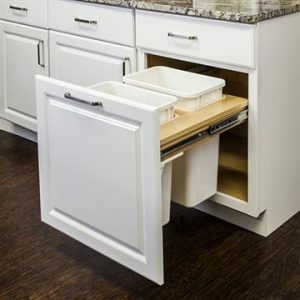 Check out these new Waste Can Organizers here and keep your kitchen waste organized and out of site with the waste can solution that fits your space.